A highly controversial novel, imagining France under Islamist leadership in the near future, has hit stores. The release shockingly coincided with a terror attack on a satirical newspaper that published cartoons of Muslim leaders and the Prophet Muhammad. The author of the novel, star French writer Michel Houellebecq, denies accusations of instigating Islamophobia with a book his critics say was a gift to the French right-wing. 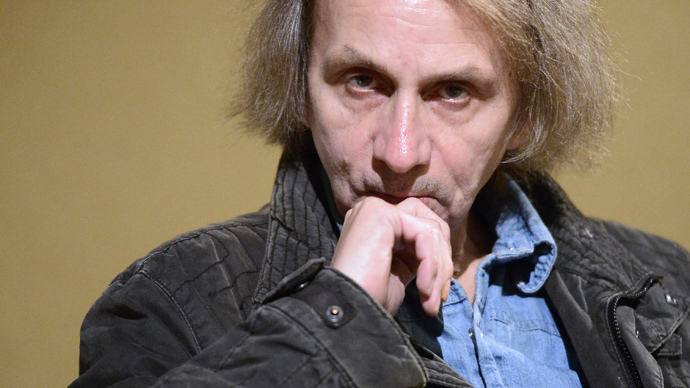 Houellebecq argues he is politically “neutral” and the book titled 'Soumission' (Submission) is only an attempt at lifting a taboo on discussing Islam. "We’ve come to a point in France where you can be criticized for merely pronouncing the word Islam,” Reuters cited the writer’s interview to Le Figaro, which is set to be published on Friday. “Islam is not among the subjects which we can really discuss. It's a little frightening." The book depicts French elections in 2022, in which a Muslim Brotherhood-style party confronts Marine Le Pen’s right-wing National Front and wins. Europe has recently witnessed a surge in immigrants from the Muslim world, with a large portion coming from countries like Syria, where military conflicts are ongoing. The trend has resulted in right-wing parties gaining prominence all over Europe. The year 2014 was the most successful ever for France’s anti-immigration National Front, which topped a national election in May and won seats in the French Senate for the first time in September. As for Le Pen, she said the book was "a fiction that could one day become reality,” according to AFP. The book, which has been at the top of France’s political agenda in recent days, is likely to stir more controversy, as its release came on the day that Paris was rocked by a deadly assault at the headquarters of satirical newspaper Charlie Hebdo. Houellebecq’s 'Submission' was on the cover of this week’s Charlie Hebdo edition. Days before the book’s release, it was already at the top of French Amazon pre-sales. The massacre at the Charlie Hebdo headquarters is likely to fuel interest in Houellebecq’s novel.